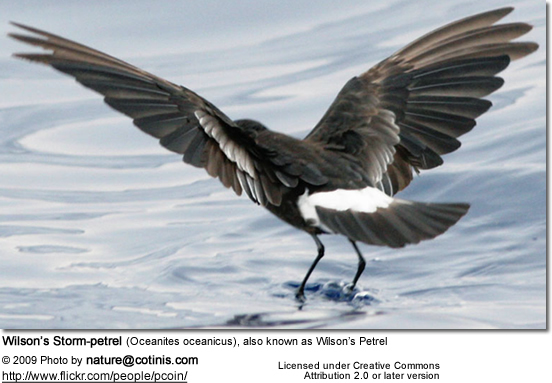 The Wilson's Storm-petrel (Oceanites oceanicus), also known as Wilson's Petrel, is a small seabird of the storm-petrel family . It is one of the most abundant bird species in the world. The name commemorates the Scottish-American ornithologist Alexander Wilson. 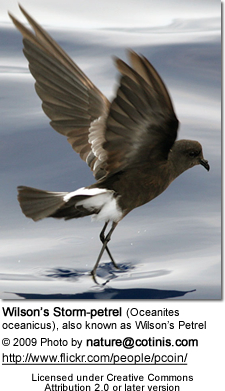 The Wilson's Storm-petrel breeds on the Antarctic coastlines and nearby islands such as the South Shetland Islands. It nests in colonies close to the sea in rock crevices or small burrows in soft earth and lays a single white egg. This storm-petrel is strictly nocturnal at the breeding sites to avoid predation by gulls and skuas, and will even avoid coming to land on clear moonlit nights. 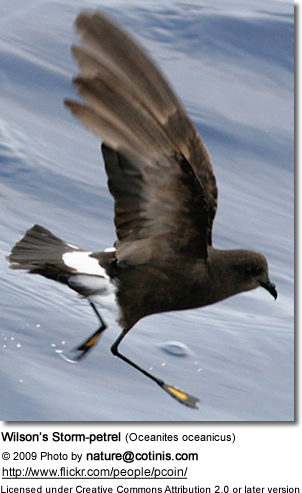 Like most petrels, its walking ability is limited to a short shuffle to the burrow.